Posted in: Community, Media Release, Traffic. Tagged: Adcock, Prather. 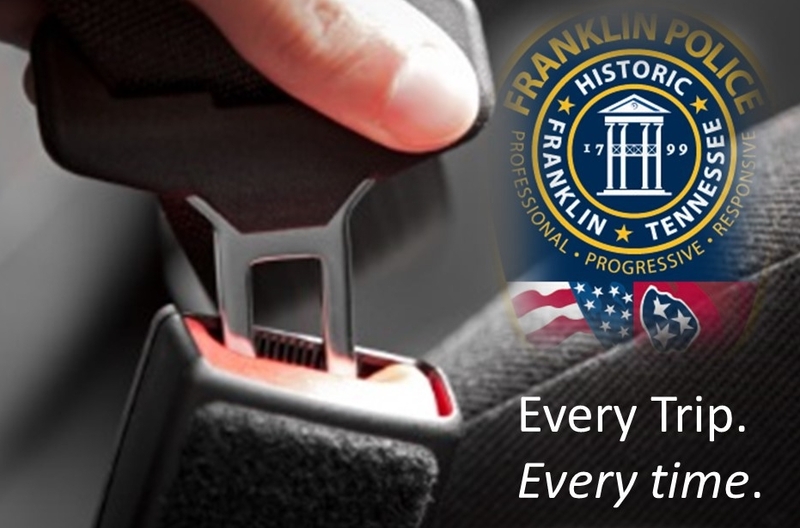 The Franklin Police Department, in partnership with the Tennessee Governor’s Highway Safety Office, is a proud participant in the 2016 SAFE (Seatbelts Are For Everyone) Campaign. The goal of SAFE is to increase seatbelt and child restraint use, to protect and save more lives on Tennessee roadways. No matter how short or long your drive may be, it is imperative that drivers and passengers buckle up – every time. “We will continue to actively enforce seatbelt and child restraint laws in Franklin,” said Lt. David Prather of the Franklin Police Department’s Traffic Unit. “We are committed to doing our part to save lives on the streets of Franklin.” Franklin Police Officers will be especially vigilant with nighttime seatbelt enforcement. According to the GHSO, Tennessee has seen a disproportionate percentage of unrestrained fatalities between the hours of 6:00pm and 5:59am. The SAFE Campaign is active and runs through August 1, 2016.